Cisco Systems introduced multiple innovations into its flagship Catalyst 6500 Series Switches at Cisco Live (the company’s annual IT and communications conference) on July 13, 2011. 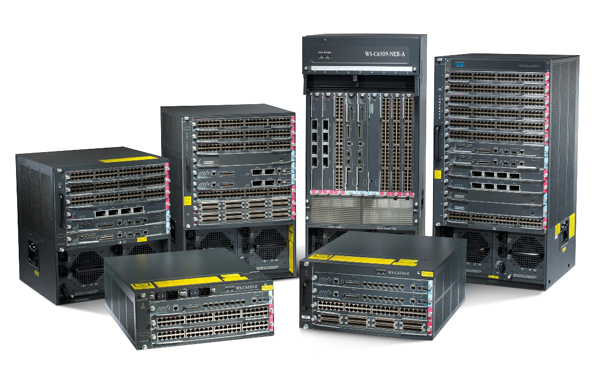 As the “workhorse family” of switches that stretches across the entire spectrum of enterprises, the Catalyst 6500 is in use by more than 25,000 customers, and one of the most important things Cisco kept in mind in this product refresh was to protect customer investment so they can continue to use the 6500 products they already have without having to do a complete rip-and-replace, said Scott Gainey, director of switching solutions at Cisco. The new capabilities are supposed to help providers tune their network infrastructure for the anticipated proliferation of connected devices, growth of video traffic, cloud computing business models and increasingly mobile workforces without having to opt for costly upgrades. What’s new on Cisco Catalyst 6500? At the heart of the Catalyst 6500 refresh is the Supervisor Engine 2T, a 2-terabit card that unlocks 80 gigabits per second per slot. The new SUP2T takes a 3x jump for the Catalyst 6500 series from 720Gbps to 2Tbps. To avoid forklift upgrades to existing 6500 customers, the SUP2T and line cards are fully compatible with all E-Series chassis models. Through backwards compatibility, it protects the investment of its installed base, but paves the way for 2Tbps of switching capacity and when deployed in a virtual switching system (VSS) configuration, will scale to 4Tbps. What does the ability to download 2 terabits in a second mean: approximately 250 (1GB) Harry Potter DVDs(i.e. : 15,000 DVDs per minute). Over 200 software features have been added to Cisco IOS software to add features for security, mobility, video/voice and virtualization. An updated security architecture in the new IOS includes a full Cisco TrustSec implementation, including hardware-based MacSec for wire-rate data, Security Group Tagging and Security Group Access control lists. The new IOS also offers system-comprehensive and multiprotocol NetFlow, which allows for enhanced and granular monitoring for IPv4, IPv6, multicast and MPLS traffic. With this refresh they can now maintain 1 million NetFlow entries – a fourfold increase. With a 10 year history of Catalyst 6500 deployments and market share hovering around 70 percent, the focus for Cisco is to help its customers receive unmatched investment protection. With the new SUP2T they will extend the life (and margins) of the 6500 series and service a market that is dividing into the data center and campus models. Cisco also announced next-generation borderless services. They include the Next Generation Firewall (ASA-SM), the Application Control Engine (ACE30), the Network Analysis Module (NAM-3) and the Wireless Services Module (WiSM2). The biggest change in the borderless services modules is performance enhancements. The ASA-SM is a three times improvement over previous firewalls. The NAM-30 sports a 10 times performance enhancement over the previous version of the module. The WiSM2 provides 802.11n performance and scalability while also provides the ability to centrally manage up to 500 access points and 10,000 clients from the module. To get all of the more than 200 new/enhanced features available on the 6500, all a business has to do is upgrade the supervisor engine, Gainey explained. The price tag associated with that is $38,000. In comparison to HP, Gainey said HP’s solution is almost three times the price and has a third of the performance. The migration path is fairly simple and seamless, said Kumar Srikantan, vice president of marketing for Cisco’s Scalable Networks Business Unit (SNBU). There are both technology and economic factors that come into play in migrating to the latest technology in the 6500 Series, he said. From a technology perspective, the large installed base meant Cisco had to make sure all the old technology continued to work. “Now it’s never perfect, but you can make the new technology integrate and work with the old line cards, and you can basically preserve 65 to 70 percent of the old investment,” Srikantan said. All of the 6500 technology that businesses have invested in since 1999 will continue to work. Economically, Cisco offers discounts when customers trade in old technology, so they can still get some value out of their old 6500 linecards if they choose to upgrade. “I think that’s worked very well for us. Some customers take advantage of it and some don’t,” Srikantan said. For partners, the opportunity revolves around capitalizing on the existing installed base by offering customers increased performance at a reasonable price, as well as by maximizing profitability in doing network assessments and providing lifecycle management services, said Wenceslao Lada, vice president of borderless networks in the worldwide partner organization at Cisco Systems. “With the introduction of this platform, we have brought a very high level competitive platform into the marketplace,” Lada said. Even though the performance and scalability is shooting skywards, partners are able to use the resources and skills they’ve already invested in – and in many cases, have been using for the last decade. Partners already trained and certified on the 6500 don’t require any additional education to sell the upgraded technology, which Lada said is something unique to Cisco in this space. “It’s even very important for the partner. To bring this platform to the market, the partner doesn’t need to go through any technology training or certification or change the way in how they’ve been constructing the designs of the network,” Lada said. Notes: The new Catalyst 6500 Series is available now and the SUP2T has a list price of $38,000. 4 Responses to "Cisco Live: Cisco Upgrades Catalyst Series of Switches"